I received this recipe almost 30 years ago in a mailing from Eagle Brand Sweetened Condensed Milk just before Christmas. I read the directions and thought they sounded so easy, I had to try them. I have made them every year since then for Christmas. The are so easy to make, my kids always help shape then and then roll them in their favorite coatings. You can personalize them by adding different flavorings and using your favorite coatings. But they are not only easy to make, they are sooooo good. They are always the first thing to disappear from my Christmas goodies. I will reprint the recipe like it is written. We can't buy chocolate chips in the smaller bags any more, but you will know how much you will need in total weight. It is approximately one full and an additional 2/3 bag of the 350g / 12 oz. bags. In a heavy saucepan, over low heat, melt chocolate chips with sweetened condensed milk. Remove from heat, stir in vanilla. Chill for 2 hours or until firmed up slightly. Shape into 1-inch balls; roll in any of your coating choices. I like to put them into pretty seasonal coloured foil candy cups. Chill 1 hour or until firm. Store in covered container. Serve at room temperature. They keep for a month or more, if they last that long. These are soft oatmeal cookies. They are studded with raisins, walnuts and spices. You can leave out the walnuts if you like, they are just as good without them. They were one of my dad's favorites. We lived about an hour and half from each other and he was always ready for a coffee and a cookie or two when he arrived. I think about him every time I make them. I have been making these cookies since I was first married, 35 years ago. I can't believe it's been that long! Simmer raisins and water over medium heat until raisins are plump, about 15 minutes. Drain raisins, reserving the liquid. Add enough water to reserved liquid to measure 1/2 cup. Heat oven to 400 degrees F. Mix thoroughly shortening, sugar, eggs and vanilla. Stir in reserved liquid. Blend in remaining ingredients. Drop dough by rounded teaspoonfuls about 2 inches apart onto ungreased baking sheet. Bake 10 to 14 minutes or until light brown. Makes about 6 1/2 dozen cookies. I have been making these muffins for about 30 years now. They are a family favorite and you are always sure to find a bag of them in our freezer. They are nice and moist inside and when they first come out of the oven, have a nice crunchy exterior. 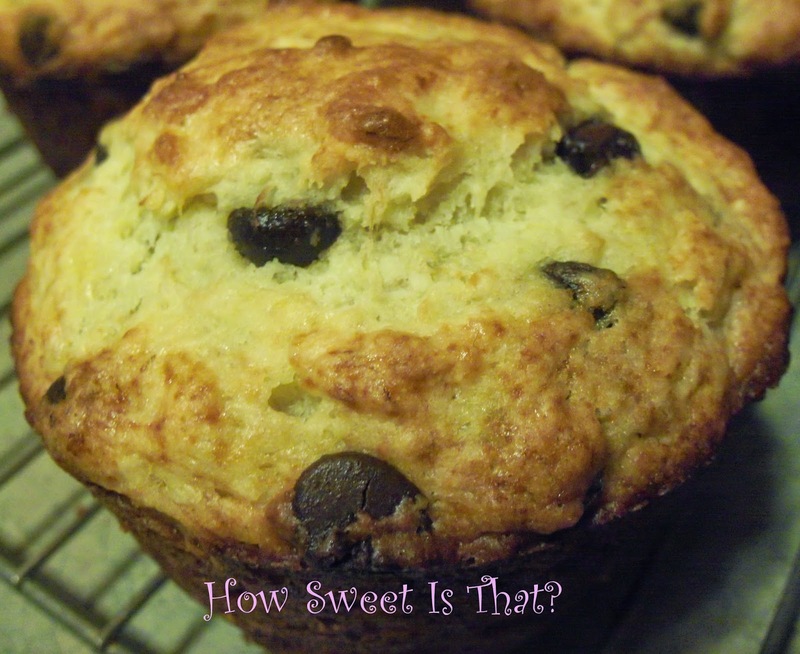 They are super easy to throw together and are a great way to use up a couple of over-ripe bananas. Heat oven to 400 degrees F and grease 12 large muffins cups. Beat eggs in a mixing bowl and stir in banana, chocolate chips and butter. Sift remaining ingredients together into egg mixture and stir only enough to blend (batter will be lumpy). Spoon into pans filling about 2/3 full. Bake until well browned, about 17 to 20 minutes. Makes 1 dozen standard sized muffins. 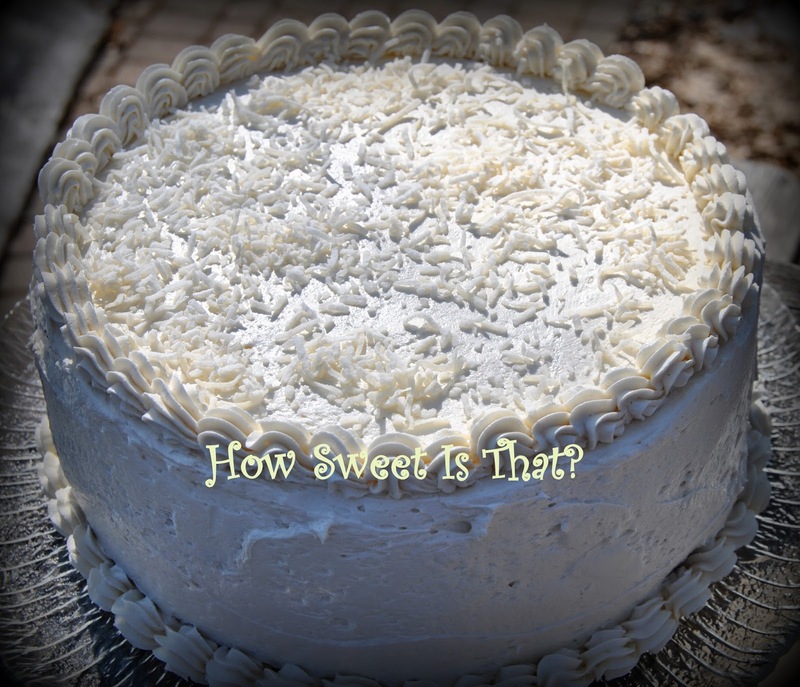 If you like coconut, you'll love this cake. This recipe maybe takes a little work because of the icing, but it is worth it. It is a plain looking cake, but it is really good. It has a nice soft crumb to it and it stays fresh for days. I had a piece of this cake on Thursday after I had made it on Sunday and it was still nice and moist. It's just a really good cake. If you're looking for something special to make for company, but not too fussy, this is it. In a large mixing bowl, cream together the butter, shortening, baking powder, sugar, salt, extracts until fluffy and light, at least 5 minutes. Add the egg whites to the butter mixture one at a time, beating well after each addition. Stir one-third of the flour into the creamed mixture, then half the milk, another third of the flour, the remaining milk and the remaining flour. Be sure to scrape the sides and bottom of the bowl occasionally through this process. Fold in toasted coconut. Pour batter into two greased and floured or parchment-lined 9-inch round pans. bake the cakes for 25 to 30 minutes or until a cake tester comes out clean. Remove the cakes from the oven, let cool 10 minutes and remove from pans to continue to cool. Remove the parchment at this point. Place the egg whites in the bowl of a stand mixer. Place the corn syrup, sugar and water in a medium-sized saucepan. Stir over heat until combined and the sugar has dissolved. Cover the pan, bring to a boil and boil for 3 minutes without stirring. Remove the cover and cook to the soft ball stage, 240 degrees F.
Meanwhile, begin to beat the egg whites on slow speed. When they are foamy, add the cream of tartar and salt. Gradually increase the speed of the mixer, continuing to beat until soft peaks form. As soon as the sugar syrup reaches the soft ball stage, remove it from the heat. Turn the mixer off. Very carefully pour about a quarter of the syrup down the inside of the mixing bowl. Turn the mixer on and beat well. Add the syrup in two more additions, working as quickly as possible. If the sugar is slightly overcooked and begins to harden, return it to the heat for a moment to re-melt it. Continue to bear the meringue until it cools to room temperature. This takes about 20 minutes. Feel the bottom of the bowl, it should feel completely cool. If you try to add the butter before the meringue is cool, the butter will melt. When the meringue is cool, beat in the room-temperature butter a bit at a time. If the frosting starts to separate, continue beating without adding any more butter until the frosting looks fluffy again. Beat in the vegetable shortening. Beat in your flavourings. On your serving plate, place one of your baked cakes, upside down. 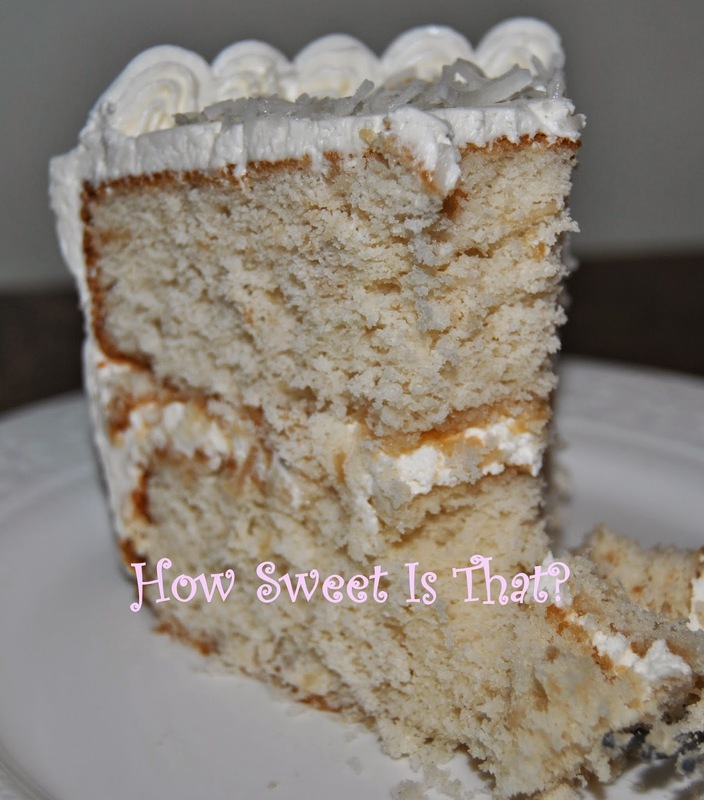 Cover the top of the cake with buttercream, then top with the other layer of cake. Frost the top and sides as desired. I find there is plenty of buttercream for adding additional piped decorations. When my kids were little, we always had a full cookie jar. All the kids in the neighborhood knew they would likely get a fresh homemade cookie when they came to our house to play. Needless to say, the neighborhood kids played at our house most often. The list was long of favorites that were made on a weekly basis, but this cookie was in the top ten for sure. 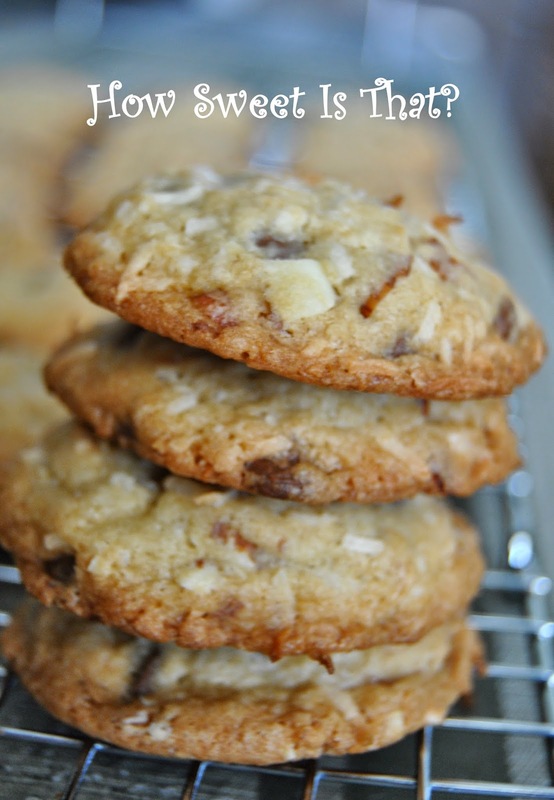 I love the combination of the chocolate, the coconut and the crunchy almonds. It was a real crowd pleaser. In a large bowl, cream butter and sugars until light and fluffy. Beat in eggs and extracts. Combine the flour, baking soda and salt; gradually add to creamed mixture and mix well. Stir in the coconut, chocolate chips and almonds. Drop by rounded teaspoons, 2 inches apart onto ungreased baking sheets. Bake at 375 degrees F for 9 to 11 minutes or until lightly browned. Cool for 1 minute before removing from pans to wire rack. This cheesecake is one of those thick and dense cheesecakes. There is nothing light and airy about this one. You can either use the recipe below for the crust or substitute an Oreo cookie crumb crust. 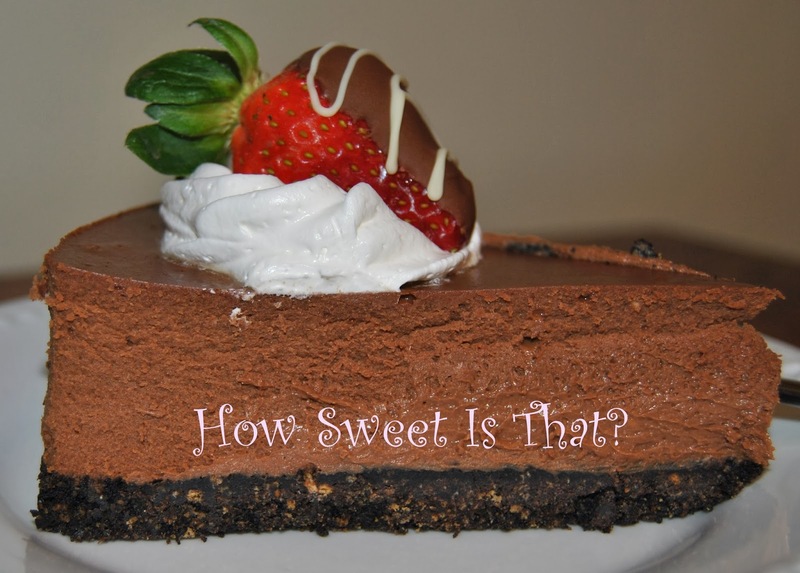 Either way, this cheesecake is heavenly. 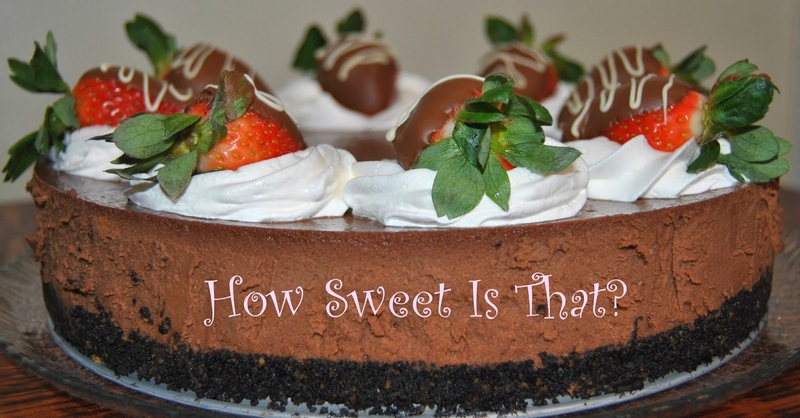 It's just the right balance of chocolate and cheesecake. For Valentine's Day, I added some whipped cream and chocolate covered strawberries. Combine all ingredients in a medium bowl. Press into the bottom of a 9-inch springform pan. 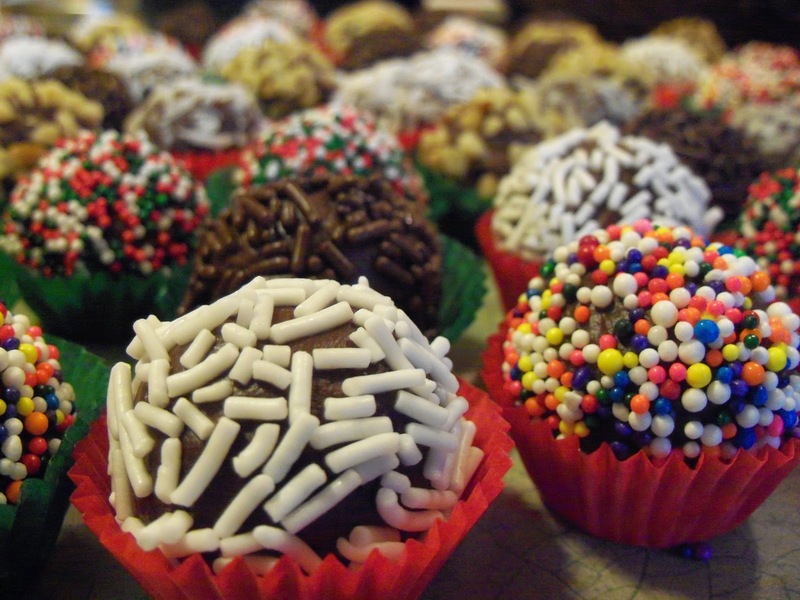 Preheat oven to 300 degrees F. In the microwave, melt chocolate chips. Set aside. In a large mixer bowl, beat cheese until fluffy. Gradually beat in condensed milk until smooth. Add melted chips, eggs and vanilla: mix well. Pour into prepared pan. Bake 1 hour and 5 minutes or until center is set. Cool; chill. Cover leftovers; refrigerate. I know this is a little late, Christmas has just passed, but I didn't want to post this recipe until I tried it myself. This is a very old recipe that my grandmother used to make every year. I haven't had it in more than twenty years. I just found this recipe among some of her old recipes in the fall. I made the cakes in early November and they're supposed to rest for a couple on months before you eat them, so I never actually sampled them until this passed week. I love Christmas cake and this recipe is likely the reason why. If you aren't a big fan of Christmas cake but would like to try making one, I would suggest this one because it is really good. You won't be disappointed. Heat oven to 275*F. Line a 10" tube pan or two 9" x 5" x 2 1/2" loaf pans with greased heavy paper or parchment paper. Cream butter and sugar until light and fluffy. Add eggs, one at a time, beat well after each addition. Sift together flour, baking powder and salt and sift over fruit and nuts in a large bowl. Mix until all the fruit is coated with flour. Blend fruit and flour mixture into creamed mixture alternately with orange juice, starting and ending with juice. Pour into prepared pan(s) and bake 3 to 3 1/2 hours for tube pan or 2 1/2 to 3 hours for the loaves. Makes one large tube cake or two generous loaves.